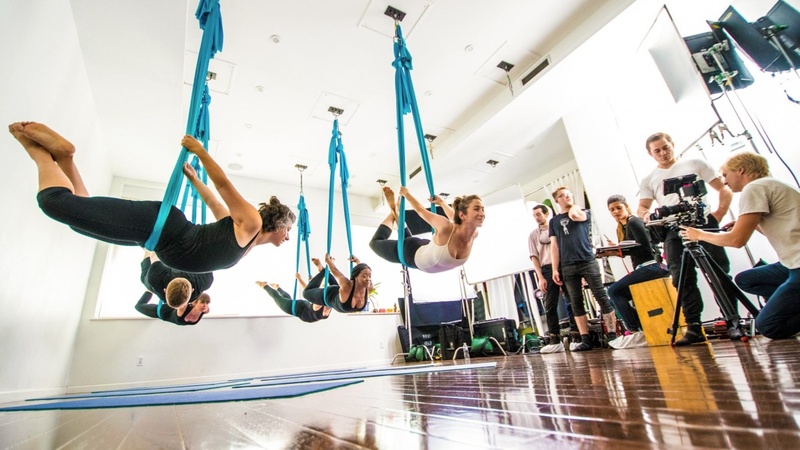 What Makes Unnata Aerial Yoga Special? Unnata Aerial Yoga was born of Michelle Dortignac’s 20+ years of yogic teaching, meditation practice, and movement and aerial arts performance. It is a comprehensive discipline, grounded in yogic tradition, that offers challenge and change for your whole being – body, mind and spirit. Find out more about the Unnata Aerial Yoga difference. Find a class near you on our Unnata Aerial Yoga Class Finder. As Yogis, our wisest leaders tell us that we must embrace unconditional love for each other if we are to find true transformation. And yet, many of us feel fear, sadness and anger more often than we feel peace and serenity. It’s not easy to simply drop an emotion and change our thoughts on a dime, so how can we navigate our way to that place of Yoga in our minds? What is Unnata Aerial Yoga? Have a watch and see! Unnata is excited to announce our new short promo video! Of course there’s plenty of info about Unnata right here on our website, but we’ve produced this short video to help explain what Unnata is and how it works in both words and moving images. Our good friend — and Unnata teacher — Elizabeth Ayers brought a 12-person film production crew up to NY, and we spent a day filming at the Sacred Sounds Yoga center here in NYC. Video editing is by NY friend Tim Guetterman. And finally, the wonderful voiceover was recorded by NY aerialist-turned-actress, Cody Schreger. Great work everyone! A couple of still images from the video shoot at Sacred Sounds Yoga. I am lucky to live in the same city as Master Yogi Dharma Mittra. Dharma is one of the few Yoga teachers alive today who has received traditional teachings directly from a guru, and practiced those teachings for over 50 years. An authentic Yoga practice is not limited to the physical exercises of asana. It includes dietary guidelines, ethics, breathing techniques, meditation techniques, and more. These limbs of an authentic Yoga practice help us transition from a small, limited perception of life to a larger perspective of wholeness, which inspires a sense of internal calm. Anyone who studies with Dharma can see his authenticity; and for those of us who wish to pursue Yoga studies beyond physical fitness, we cherish our opportunities to study with this Master Yogi. But I’m not writing this message to convince you to take classes with Sri Dharma Mittra. Instead, I want to inspire you to take classes with teachers in addition to Dharma Mittra. 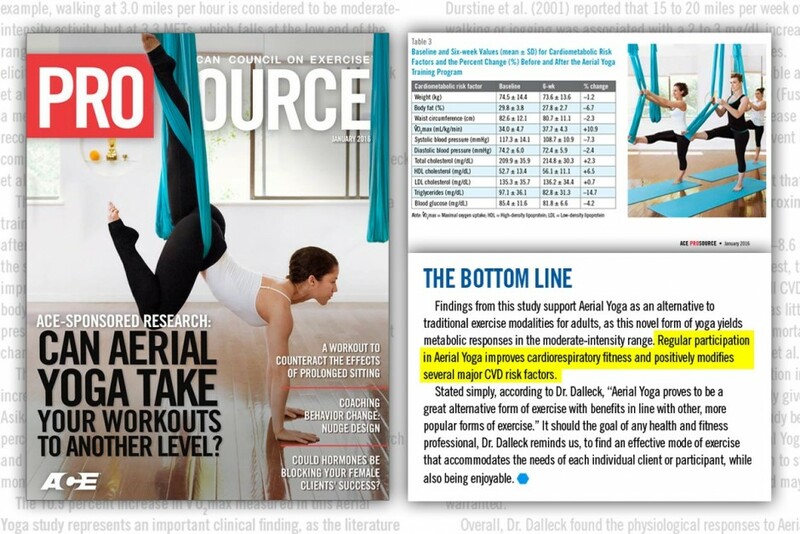 Unnata Aerial Yoga Featured in DOYOUYOGA! “Aerial yoga has definitely caught on in the past few years, and it’s easy to see why. Who wouldn’t love to invert with ease, with the added bonus of feeling weightless? Unnata Aerial Yoga got the Aerial ball rolling, and is a traditional yoga asana class that uses a hammock hung from the ceiling to help you with many of the traditional floor postures. Sometimes your body is partially supported by the hammock, and sometimes it’s supported fully. See the full article on the DOYOUYOGA website. While the Unnata® Aerial Yoga method is designed to deliver an authentic Yoga experience rather than being just a fancy exercise or fitness class, it’s reassuring to know that the entire Aerial Yoga spectrum offers powerful health benefits for its practitioners. The American Council on Exercise (ACE) certifies fitness and personal trainers in the US. Those are pretty powerful results! The full article is quite technical in nature — it’s an exercise physiology organization — but we invite you to read it over on the ACE Fitness website. THE BOTTOM LINE: Findings from this study support Aerial Yoga as an alternative to traditional exercise modalities for adults, as this novel form of yoga yields metabolic responses in the moderate-intensity range. Regular participation in Aerial Yoga improves cardiorespiratory fitness and positively modifies several major CVD risk factors. Stated simply, according to Dr. Dalleck, “Aerial Yoga proves to be a great alternative form of exercise with benefits in line with other, more popular forms of exercise.” It should be the goal of any health and fitness professional, Dr. Dalleck reminds us, to find an effective mode of exercise that accommodates the needs of each individual client or participant, while also being enjoyable. You can also read/download the article in PDF format here. I recently had the misfortune of experiencing a severe allergic reaction. My skin erupted in all-over itching and burning, aggravated by all elements – heat, water, wind, and touch. Within a few days, my entire existence became intolerably irritated. 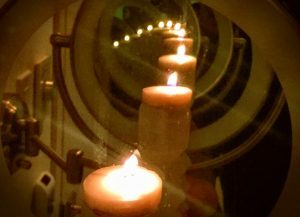 Up until that moment, my skin had been a guardian angel – a shield from external assaults, and a safe-keeper of my internal vitals. This time, however, the skin was being attacked from the inside, not the outside, and quite understandably, it reacted dramatically. Firstly, I must tell you how significant and life changing this style of yoga has been for me and others I am close with. Michelle’s class was the first group yoga class I’d ever gone to, back in 2009. Prior to that, I did yoga along with videos to help my chronic low back pain. The asanas in the silks, along with the chanting, meditation and pranayama Michelle integrated into this class changed everything for me. It healed me in so many ways. Without the physical release from pain I would not have been able to open my heart, soul, and mind in the ways I have. Unnata has been a true blessing in my life. Thank you so much for having chosen Unnata® Yoga for your Aerial Yoga teacher training. We’re sincerely honored to have you as part of our community of dedicated professional aerial yoga teachers. If you’re reading this, it’s likely been a year since your last renewal (or initial teacher training with membership included), and we’re now inviting you to renew your membership and license to the Unnata Aerial Yoga community for another year. When you renew your Unnata membership, your participation helps the entire Unnata community grow and prosper. And for yourself, you’ll have access to the continuing support, education, and benefits available to our members such as the Unnata Yoga teachers’ Facebook group (active and frequent discussions from over 200 passionate and experienced Unnata teacher members! 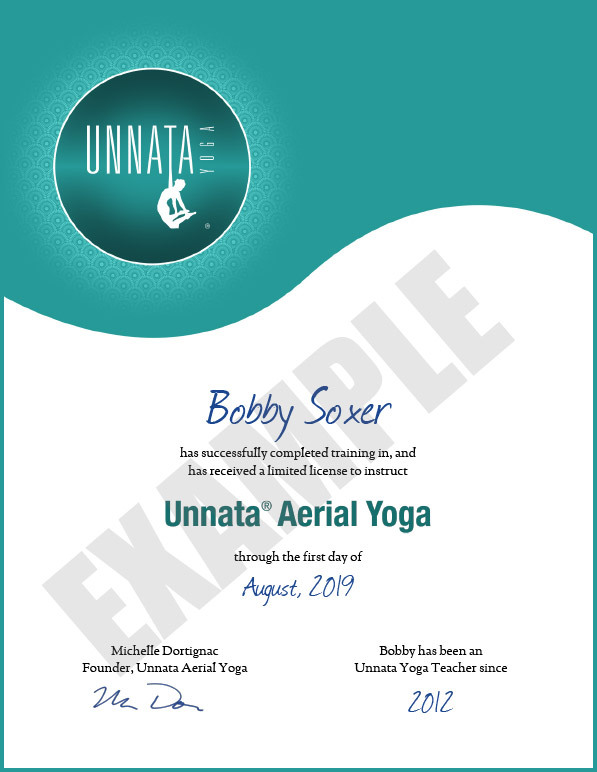 ), access to educational videos and classes, use of the Unnata brand name and logo in order to distinguish yourself from other generic aerial yoga teachers or techniques and a listing on the Teacher Locator section of the Unnata website. And now, studio owners can renew all of their Unnata teachers’ memberships for a reduced multi-license fee. See membership renewal page for more details. We’re continuing to expand the support system we’ve created for graduates of Unnata Aerial Yoga teacher training programs, and we’d love for you to continue to contribute to, and benefit from that effort. In addition to curating the Facebook group just for Unnata Yoga teachers, and promoting you and your classes through the aerialyoga.com website, we’re adding translations of the website into different languages, creating more advanced and continuing education training courses, supplying reviews and updates of the Unnata Aerial Yoga method, and offering on-line Unnata Aerial Yoga classes. Importantly, we’re also pursuing and obtaining trademark protection for the Unnata Yoga name in several countries besides the US (including Japan, Russia, China, Brazil, Canada, and the EU), in order to help the global public understand the special difference that is Unnata Yoga. 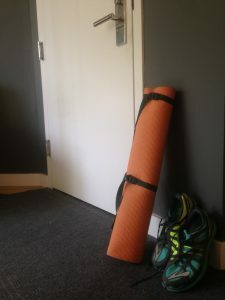 Our goal is to serve you and all Unnata Yoga teachers as best as possible, so please let us know how your classes have been going, and if there is anything that can be done for you, or if you have any questions or suggestions. Your feedback is invaluable. Thank you again for being a proud member of the Unnata community, and for your continued participation, passion, and support. Te agradecemos que hayas elegido Yoga Unnata® como tu formación de yoga aéreo. Es un honor para nosotros que formes parte de nuestra comunidad de profesores de yoga aéreo profesionales y comprometidos. Si estás leyendo esto, probablemente ha pasado un año desde tu última renovación (o desde que completaste tu formación de profesores inicial con afiliación incluida), y ahora te invitamos a que renueves tu licencia y afiliación a la comunidad de Yoga Aéreo Unnata un año más. Cuando renuevas tu afiliación a Unnata, tu participación ayuda a toda la comunidad Unnata a crecer y prosperar. Y a ti te permite tener acceso al apoyo y educación continuados, y a los beneficios que disfrutan nuestros miembros, tales como el grupo de profesores de Yoga Unnata en Facebook (discusiones activas y frecuentes entre más de 200 profesores de Unnata apasionados y experimentados); acceso a vídeos educativos y clases; la utilización de la marca y logo de Unnata, que te diferencian de otros profesores y sistemas de yoga aéreo genérico; y una entrada con tus datos en el directorio de profesores del sitio web de Unnata. Además, ahora los propietarios de centros de yoga pueden renovar las licencias de todos sus profesores de Unnata por una tarifa multilicencia reducida. Seguimos expandiendo el sistema de apoyo que hemos creado para los profesores titulados de Yoga Aéreo Unnata, y nos encantaría que sigas beneficiándote y también contribuyendo a este esfuerzo. Además de mantener el grupo de Facebook para profesores de Yoga Unnata y promocionaros a ti y a tus clases a través del sitio web aerialyoga.com, estamos añadiendo traducciones del sitio web a diferentes idiomas, creando cursos de formación más avanzados y continuados, proporcionándote revisiones y actualizaciones del método de Yoga Unnata y ofreciendo clases online de Yoga Aéreo Unnata®. Además estamos solicitando y obteniendo protección legal para la marca registrada de Yoga Unnata en varios países además de Estados Unidos y la Unión Europea (entre ellos Japón, Rusia, China, Brasil y Canadá), con el fin de que el público global comprenda que Unnata Yoga es un sistema diferente y especial. Nuestro objetivo es serviros a ti y a todos los profesores de Yoga Unnata lo mejor posible, por lo que nos gustaría saber cómo van tus clases y si hay algo en lo que podamos ayudarte, o si tienes cualquier pregunta o sugerencia. Tu aportación tiene un gran valor para nosotros. Gracias por formar parte de la comunidad Unnata y por tu participación, pasión y apoyo continuados.